TJ Electrical carried out commercial electrics in Cheam at the Constellation Club, overhauling the emergency lighting and other various new lighting systems throughout the building, plus alterations to the fire alarm system. TJ Electrical carried out commercial electrics in Cheam during the refurbishment of the Constellation Club, North Cheam. 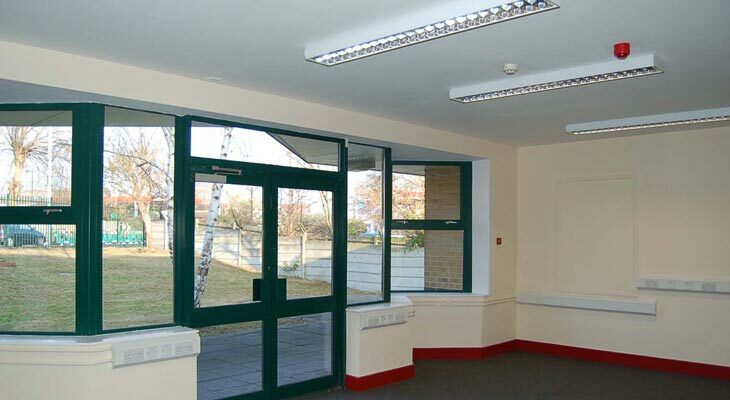 Our job was to overhaul the emergency lighting and other various new lighting systems throughout the building, plus make alterations to the fire alarm system such as adding flashing beacons in all rooms in order to comply with the Disability Discrimination Act (DDA) regulations. 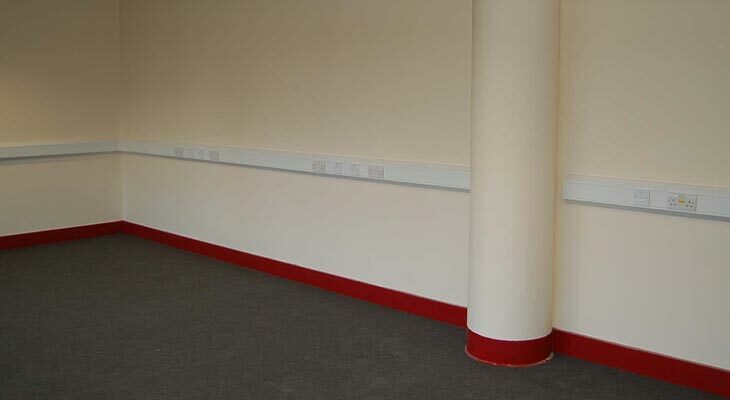 Also, as specialist electrical trunking installers in Croydon we fitted new three compartment dado trunking to all of the multipurpose office rooms and ran new power layouts and data cabling throughout. Overall the project took six weeks to complete and because a number of the rooms were divided and partitioned off, we altered the circuits and added extra components so that all partitions would house smoke detectors and fire alarms. Special attention was given to the reception area where we installed a hearing loop (hearing loops act as boosters to amplify the sound for those that require help with their hearing). 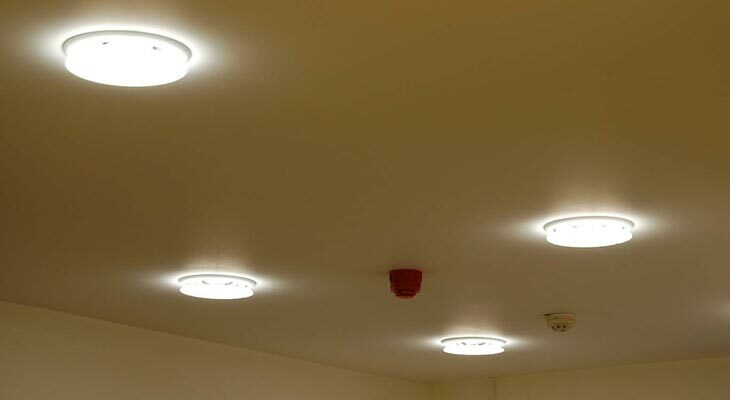 If you require emergency lighting specialists in Cheam, fire alarms specialists in Croydon, or electrical contractors across London and the south east, please contact TJ Electrical. We are here to help. In the office area we designed and installed surface mounted three compartment dado trunking with numerous power sockets and data points. The trunking acted as a great space saver because it allowed us to run the power and data cables within the different compartments. 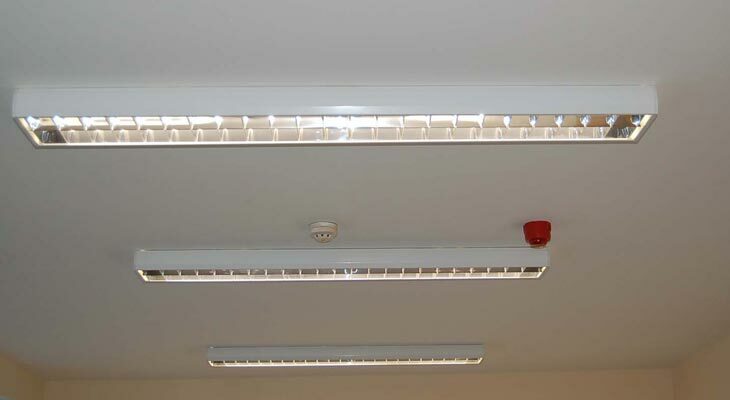 Also in the office area we designed and installed CAT3 five foot fluorescent surface mounted office lights, plus a smoke detector and a fire alarm flashing beacon (which both sounds and flashes like a strobe light). We wired everything from the loft space above the ceiling. A wider shot of the office area as it looks out over the grounds. 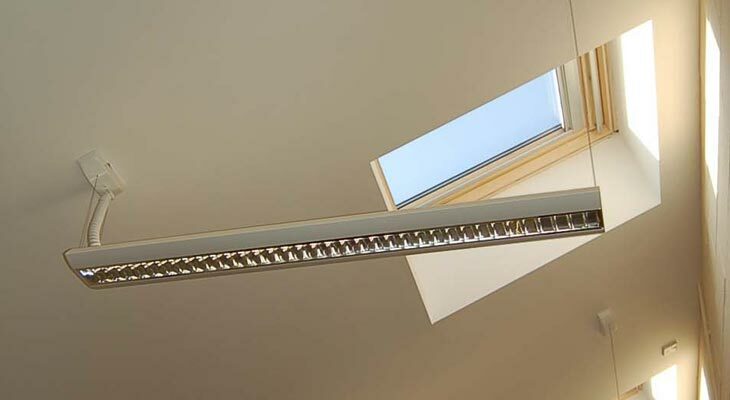 TJ Electrical contractors in Croydon design, supply and install a wide range of office lighting systems, trunking systems and fire alarms in Cheam and the surrounding areas of London and the south east. Contact us for help. 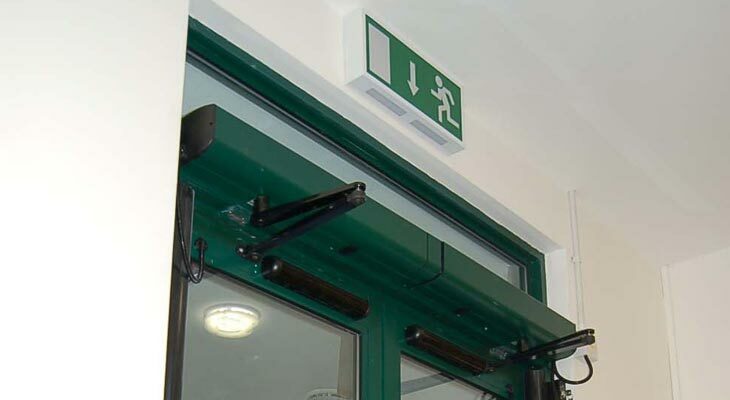 Our Croydon emergency lighting specialists installed running man emergency exit lighting where needed. British standards regulations state that as a minimum requirement all exits and escape routes together with changes in direction must be clearly highlighted. For a more aesthetically pleasing look in the reception, we installed recessed circular compaq lighting in the ceiling together with a smoke detector and a flashing beacon, plus a wall mounted six inch fire alarm bell. Our electricians wired everything from above in the loft. 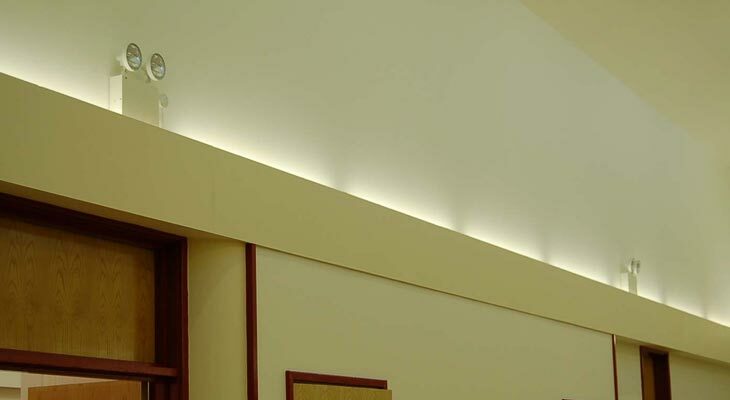 In the main hall our emergency lighting specialists installed twin spot emergency lights that last up to three hours. Our Croydon electricians also re-lamped and re-fitted a number of the broken up-facing fluorescents lights that are used when functions are held at the Cheam venue. During this project as an electrical contractor in Cheam, we redesigned the overhead lighting in a few rooms with odd shaped ceilings. 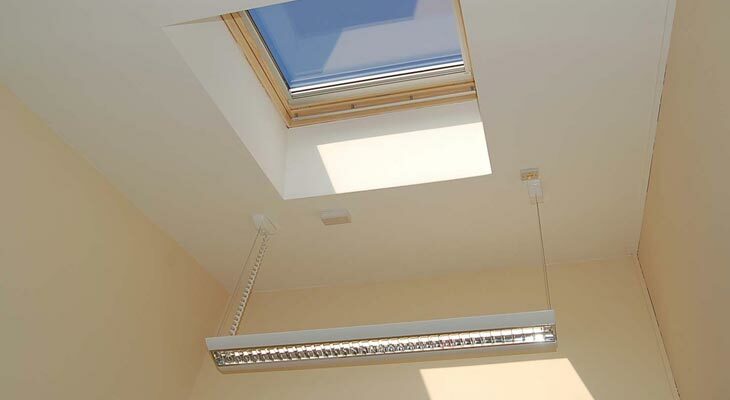 Instead of flush mounting to the slanted roof line, we suspended the fluorescent lighting parallel to the floor so that it provided an even plane of light. Special fixings were used to install the suspended lighting (you can see the right-hand side encases the electrics to power the lights while the left-hand side is suspended by wire). This provided the added bonus of bringing the lights down to a manageable level for maintenance.